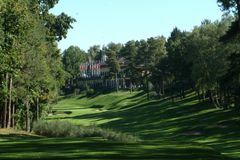 Set against the backdrop of the stunning Lake Montorfano, the course at Circolo Golf Villa d'Este is not only beautiful, but also has the reputation of being one of the most demanding par-69 layouts in Italy. Recent improvements have made a huge difference to the original Peter Gannon design, which was inaugurated in 1926. The fairways are lined uniformly by ash, pine and chestnut trees, making accurate driving the most crucial determinant in scoring well. Measuring 6,331 yards from the championship tees, Circolo is by no means long, but the narrow fairways demand high quality golf. Even if the bordering woodland catches you out, the spectacular scenery is sure to provide an extremely enjoyable round during a golf holiday around Lake Como.